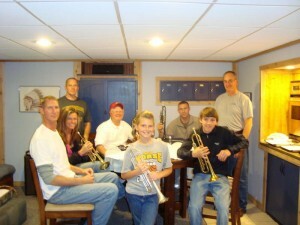 Larry DuPree is teaching new buglers in Cincinnati to sound Taps as the call as written. The current class consists of Ohio Military Honor Guard members of the Army and Navy, a Marine League Honor Guard member and others interested in providing â€œLiveâ€ Taps. The course is 6 months long, meeting once a week for the first month and monthly thereafter. The course covers the story of Taps, embouchure development, breathing exercises and mental tips to enhance performance. Guest musicians will be invited periodically. Larry is an Air Force veteran and continues to serve by sounding Taps at military funerals. This entry was posted on Thursday, November 4th, 2010 at 2:26 pm	and is filed under Bugles for Performing and Collecting, History of Taps, History of the Bugle, News. You can follow any responses to this entry through the RSS 2.0 feed. You can leave a response, or trackback from your own site. Hello, I am a recently retired 1SG. I want to learn to play the bugle to help honor my fellow veterans. Is there a class close to Marion. Ohio? If not I will attend in Cincinnati if need be. Thanks. Please respond via email.